I had a tentative trip to Scotland scheduled for last month. Unfortunately, it didn’t work out, but I had gathered a bit of information – and spirits – as a pre-trip intro that I’d thought I would pass along. I navigated most of the American Whiskey Trail in just a few days, but the trail to Scotch Whisky is not that simple. A good example of what’s in store is at Distilleries of Scotland, where you will find that dozens of Scotch companies exist all over the country. It seems like there’s enough Scotch to keep everyone seeing the Loch Nest Monster! Until I do make that trip I won’t even attempt to suggest an itinerary, but I do recommend Visit Scotland as a great place to start. But if you don't have a chance to snag a cheap fare for that trip yet, I do have some suggestions for Scotch lovers. The Scotch Malt Whisky Society of America (SMWSA), founded in 1983, has a new membership program that is tailored for Scotch drinkers from novice to connoisseur. 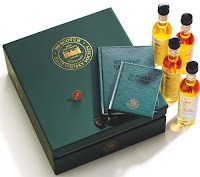 Members will receive a membership kit that has four 100ml single casks that have been personally selected by the Society’s Tasting Panel and the society’s magazine. They also receive offers to buy special blends that are not normally available commercially. They and can visit Members’ Rooms in Leith, Edinburgh and London, attend tasting events throughout the U.S. and even have the opportunity to stay at The Vaults in Leith. Membership into the Scotch Malt Whisky Society is $229 for the first year and $60 a year for each subsequent year. You can find out more at their website, http://www.SMWSA.com. Speaking of Scotch sampling, the FedEx guy was back at my door again so I gathered my friends for sampling. We had quite the selection of Scotch Whisky with eight samples of Dalmore and Isle of Jura distilleries. So, what should you look for the next time you’re ready to buy? If you are looking for a good, reasonably priced bottle of Scotch Whisky, the 12 year old Dalmore goes down smooth – mixed or straight – and is a good choice at $49.99. Dalmore’s Gran Reservera ($64.99) was even smoother, making it a better choice on the rocks, with strong citrus undertones. The 18 year old by the same company was actually the favorite of one of the tasters for its strong taste and unusual spice (Dalmore lists it as pine and lemongrass). The two big winners of the night were Dalmore’s 15 year old and the 1263 King Alexander. Ironically, thoug the King Alexander got high marks, the $250 Scotch was actually not as raved about as the 15 year old Dalmore at $79.99 for its intense flavor with a bit more sweetness than the others. If you read this blog often you know I am not a big whisky drinker, but I did find that one really smooth. Also – if you are looking for something a bit different, the Jura Prophecy ($70) is more woodsy, with smokey and vanilla flavors we didn’t taste so much in the others.